Celebrating Christmas with family and friends is such a blessing, rarely do families spend quality time with each other, and to make it more special, 22 Prime together with Corporate Chef Anthony Raymond prepares for a gathering of flavors to remember. 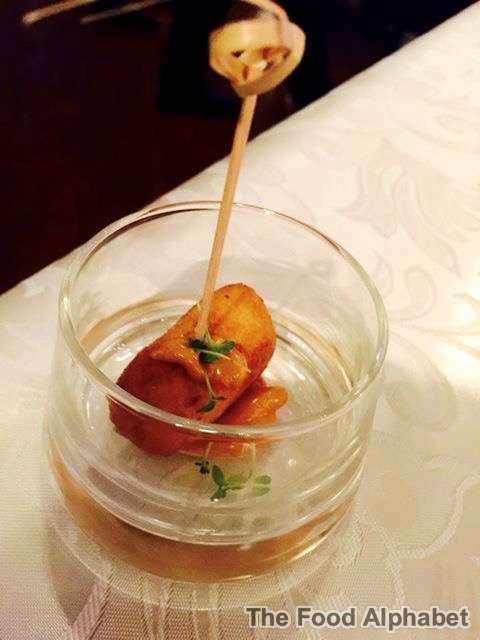 Starting off with their Chilean Sea Bass Fritter on Piquillo Pepper Aioli, much to our delight, this appetizer packs a lot of flavors, don't be fooled by its size, each bite bursts with flavorful spices, filling you with excitement as you start off your lovely dinner. Next up is Foie Gras Terrine with Petite Greens, Dried Fruit Compote, and Red Grape Gastrique, best paired with Stone Cellars by Beringer Chardonnay, California or Daiquiri de Bilbao. 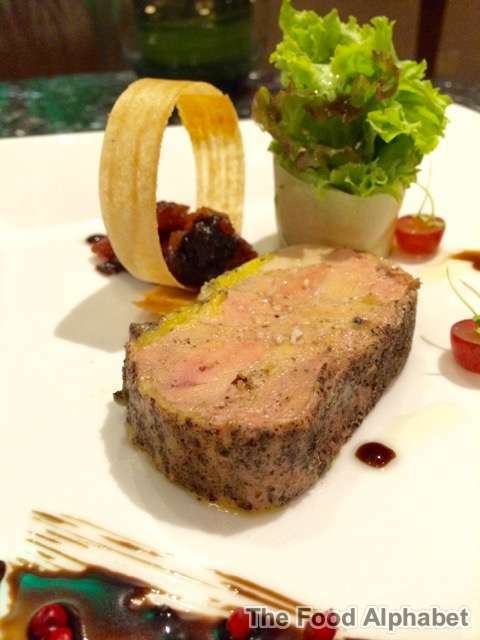 This satisfying rich dish prepared is the ultimate, purist experience of Foie Gras, since the whole raw liver is packed into a terrine mold and cooked at low temperature in a water bath, it emits a rich and buttery taste, just how Foie Gras should be. 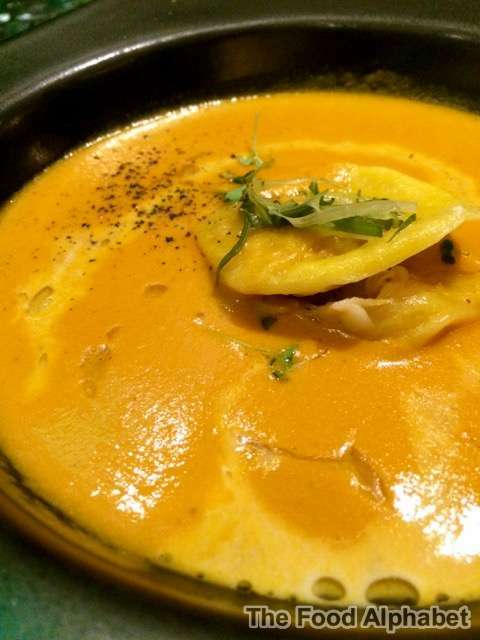 Pumpkin Bisque with Melted Leeks and Crab Ravioli, our soup for the night keeps it simple, yet every sip gives you that rich bisque texture, top it all up with sumptuous crab meat filling wrapped in ravioli, perfection indeed. Our main course, 22 Prime's signature USDA Angus Prime Rib Eye with Purple Potato Puree, Aromatic Vegetables, and Green Peppercorn Sauce, I'm would be lying if I'd say that this is just your typical steak, as 22 Prime is known for their perfect-Steak! Each slice of this lovely piece of meat, brings out the joy on my taste buds, every juicy piece commands an oooh then comes the aaaahh. I just love 22 Prime's steaks! To end the night with a bang! 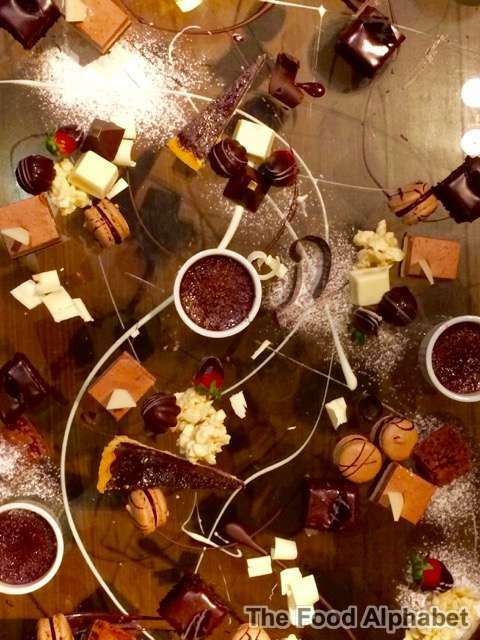 22 Prime's presents their impressive Dessert Buffet, dive into Assorted Pralines, Chocolate Covered Strawberries, Chocolate Tart, Duo of Chocolate Mousse, Chocolate Creme Brulee, Chocolate Macaroons, Decadent Chocolate Cake, and moist Fudge Brownies. 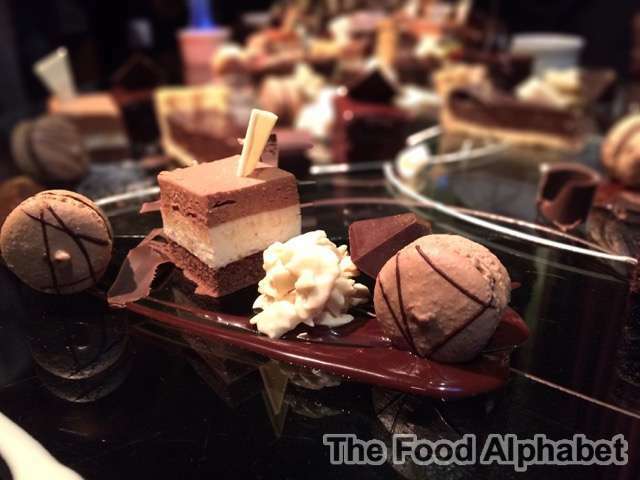 I can hear my stomach growl once more as we witness the transformation of a plain glass table to a masterfully crafted dessert table with swirls and slices of chocolate, together with your dessert favorites, truly an eye candy and a crowd pleaser. For those who want to celebrate the eye of Christmas in the hotel, 22 Prime offers a carving of Prime Rib Eye and Holiday Turkey with decadent patstires for dessert priced at Php 2,300 nett. Enjoy this special holiday treat available today until January 6, 2016. And there's more. Holiday room packages are also available when you book on December 1-30, 2015 and January 1-31, 2016, with rates starting at P 5,000 net in a Junior Suite inclusive of breakfast buffet for two. Experience the Holidays with Discovery Suites Ortigas' Cirque du Noel, and enjoy the best of the season at 22 Prime. 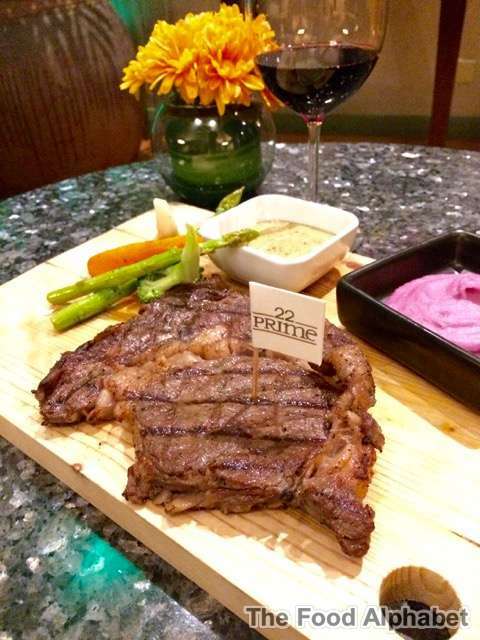 22 Prime is located at the 22nd Floor of Discovery Suites Ortigas, 25 ADB Avenue, Ortigas Center, Pasig City or call 719-8888, email rsvn@discovery.com.ph or visit http://www.discoverysuites.com/ for inquiries and reservations. Discovery Suites Ortigas is the preferred address of business and leisure travelers, as it balances the convenience of a spacious residence with the personal touches of a hotel. The 220-key all-suite property offers complimentary high-speed Internet for unlimited devices and access to PressReader. Dining options include its flagship steak restaurant 22 Prime and Restaurant 5 for Pan-Asian cuisine. Discovery Suites is one of five properties of The Discovery Leisure Company’s portfolio of distinctive hotels and resorts, and is a member of the Preferred Hotels & Resorts Connect Collection. 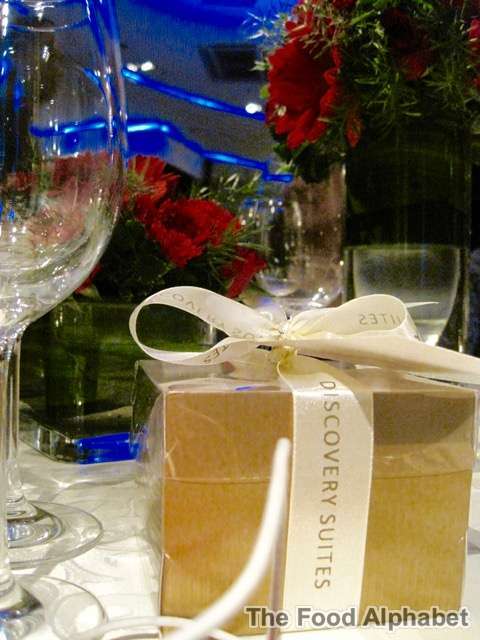 Get updates through Discovery Suites’ Facebook on http://facebook.com/DiscoverySuitesOrtigas, Twitter @DiscoverySuites and Instagram @discoverysuites.